So, here you go…..the first of the Mama In A Stitch “Fall Collection”! 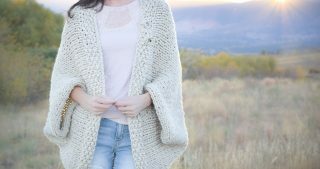 This is such a comfy and cute cardigan that I’m actually excited for some colder days in order to wear it. It looks a lot like something you’d pay $500 for in Anthroplogie, yet it’s waaaaay cheaper and and so much more special since it’s handmade. While my fave winter crocheted cardigan has probably been the Cozy Blanket Cardi from last year, it might have been beat out now by granny squares. Hehe…..And you can make one too – woo hoo! As always, scroll down to see the free pattern or you may choose to purchase the ad-free, printable version in my Etsy Shop HERE (please note it’s only one size)! 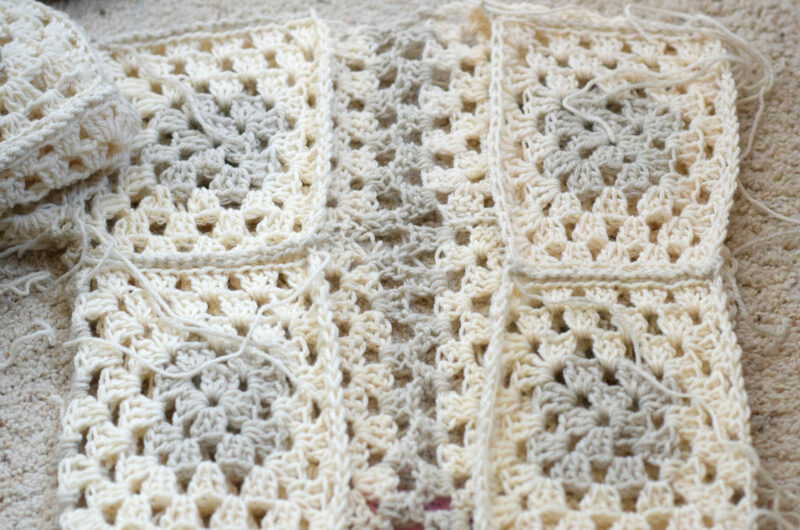 The entire piece is crocheted by making basic granny squares that are seamed together. 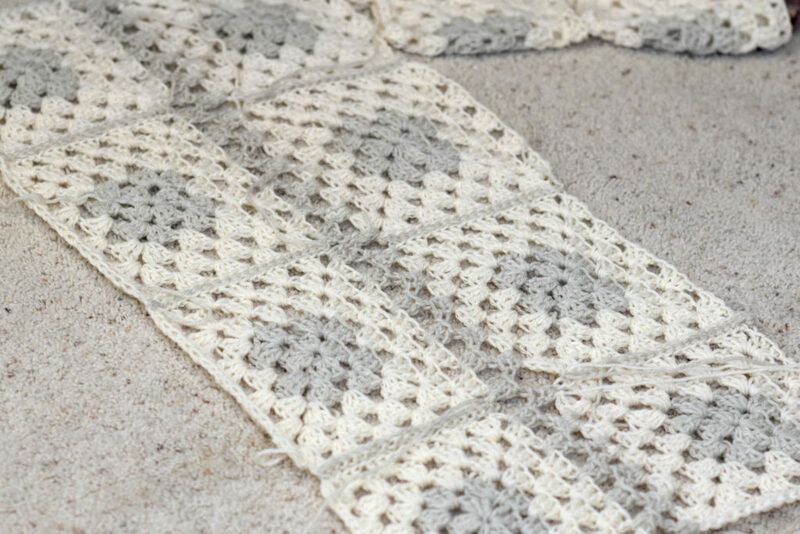 This cardigan is made with shades of white and greyish, but you can get super fun and creative with these squares. Go all out hippy and make it multi-colored. This would be a great stash buster to use up those various colors of worsted weight yarn left in your stash. 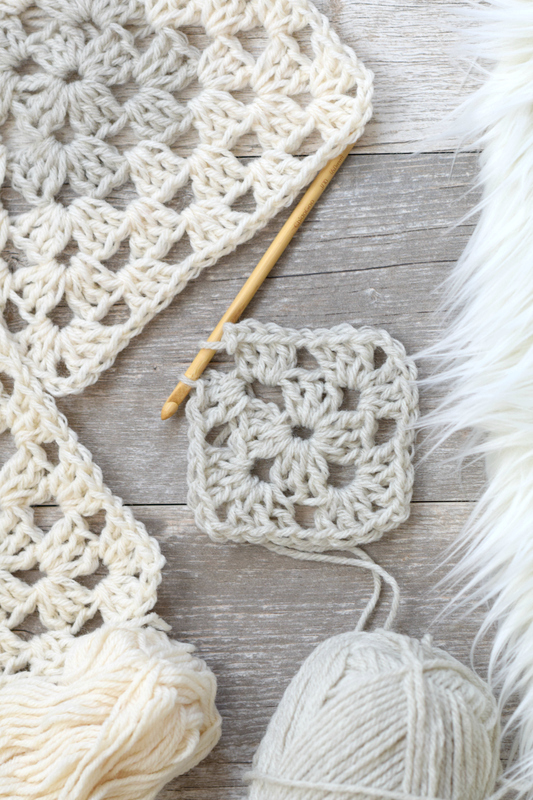 Have you ever crocheted granny squares? If you’ve never tried them, they are a lot of fun and the pattern’s easy to memorize after a couple of squares. 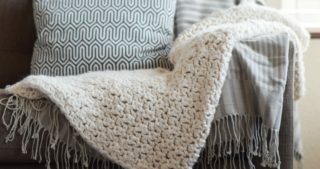 It also makes for a great travel project because you can crochet a couple of squares in the car or on the plane while in process of making a big sweater. I chose to use Lion Brand Wool-Ease worsted weight yarn (here) for this project for a few reasons. One, I had all of this in my current stash from a Jo-Ann’s spending spree last year. Two, I love the two neutral colors together and three, the yarn is high quality and I feel good about using it on a special piece like this. This fun and modern take on a granny square sweater is right on trend featuring a flattering length and big sleeves. Use your favorite colors to create your own look, or go with the understated tone with shades of cream and heather. This cardigan is made entirely of granny squares so there isn’t any difficult shaping. Gauge: (Approximate) One completed square of 5 rounds should be approximately 7.5” X 7.5”. There are approximately 2.5 rounds in a 4” X 4” square. 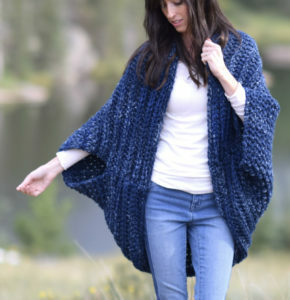 Sizing suggestions: *This pattern is one size only. If you’re experienced, you may be able to modify this to your specific size. Here are some suggestions in hopes to help you! To make this for larger sizes, you can make the back wider by omitting the joining method in step three and adding two to three rows of double crochet to each panel along the side, then seaming at the center. Equally, you would want to add width to each front panel by increasing the number of half double crochet stitching border and or modifying by adding double crochet rows to the sides of the panels before seaming. 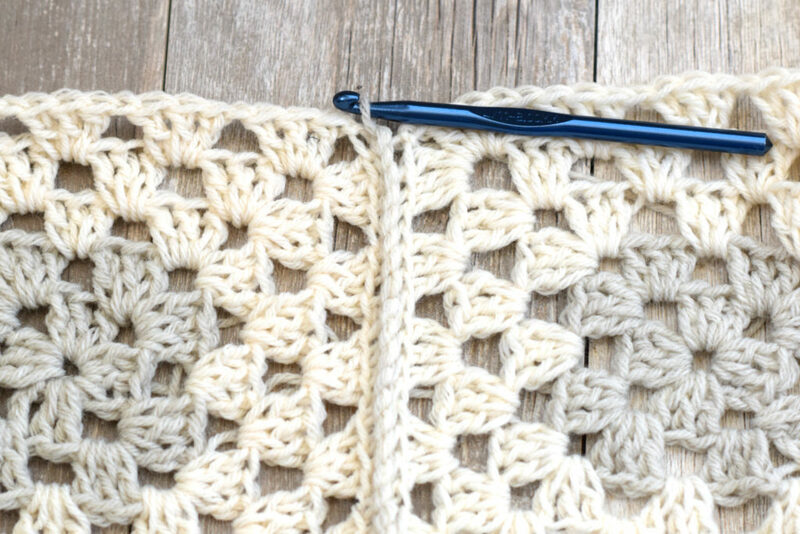 Sleeves can be made wider by replacing the use of the flat slip stitch seam to join and use the seamless join method or by adding rows of double crochet to sides of the squares in order to make them wider before seaming. Round 1: Ch 3, 2 dc in ring, ch 2, (3 dc in ring, ch 2) 3 times, sl st into 3rd ch of ch 3 at beginning of round. Round 2: Ch 3, ( 2 dc) in same ch 2 sp, * ch 1, ( 3 dc, ch 2, 3 dc) in next 2 ch sp, repeat from * 2 more times, ch 1, 3 dc in next ch 2 sp, ch 2, sl st in 3rd st of ch 3, (picking up the Fisherman color for color change) for beginning of next round. Round 3 With Fisherman Color, Ch 3, 2 dc in same ch sp, * ch 1, ( 3 dc in ch 1 sp, ch 1) in each ch 1 sp to corner, ( 3 dc, ch 2, 3 dc) in ch 2 sp at corner, repeat from * two times more, ch 1, ( 3 dc in ch 1 sp, ch 1) in each ch 1 sp to beginning of round, 3 dc in final ch 2 sp, ch 2, sl st in 3rd st of ch 3 at beginning of round. Round 4 – 5 Repeat round 3, tie off and weave in ends. Repeat above pattern to make a total of 24 granny squares. Next, you will move onto assembly where you will seam the squares together in order to make the sweater! Step 1: Seam 4 Panels – (Two front panels and two back panels) With the color Natural Heather, seam a row of 4 granny squares together, end to end, right sides out, using the Flat Slip Stitch Join method for granny squares (you can find tutorials by doing an online search) or use your preferred seaming method. Next, seam the two “cylindars” together, end to end, to create the entire sleeve. One sleeve is made up of 4 granny squares seamed together. Step 3: Seam Panels Up Center Back Seam up back panels at center using the Seamless Join method for granny squares. This is worked by crocheting 3 dc in each space between 3dc stitches on edge of panel, then working 3 dc on matching opposite panel space. This will create the look of the granny stitch and give more width to the final back panel. Tie off. Step 4: Seam Each Side using the Seamless Join Method seam, from the bottom up, ending just after you’ve seamed past the 3rd granny square from the bottom. 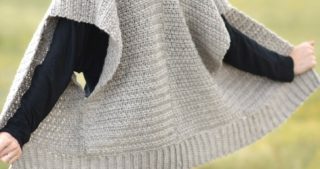 Step 5: Seam Sleeves to Cardigan – use the Flat Slip Stitch Join seam method (or preferred method) to evenly attach sleeves to the cardigan, tie off and weave in ends. 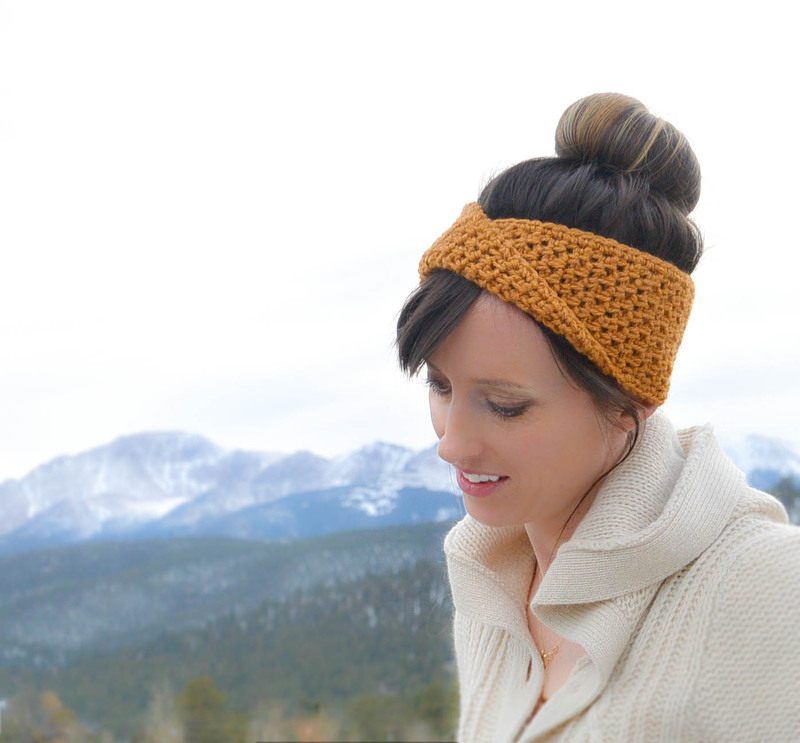 Step 6: Double Crochet Cuff – With Fisherman, double crochet evenly along the bottom of each sleeve for a total of three rounds each. Tie off and weave in ends. Step 6 Crochet Collar Detail Attach “Natural Heather” yarn at bottom of collar area and evenly half double crochet along entire collar to other end. Tie off and weave in all ends. Now, block to shape if desired! Below: The two back panels (note each panel is made of 4 granny squares) are seamed together using the Seamless Join Method. This increases the width of the back panel and also adds a nice stripe detail down the center. 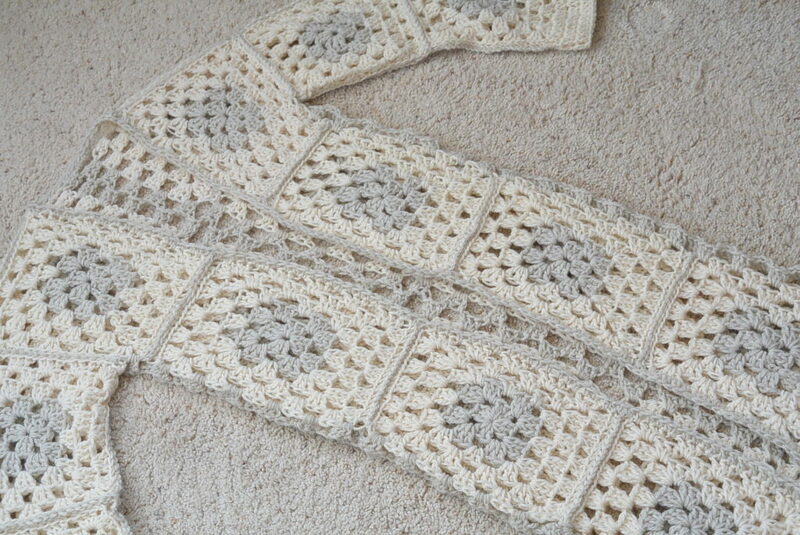 The sleeve is also finished and ready to be attached to the sweater once assembled. Below: The front panels are seamed along the sides to the back panels using the Seamless Join Method. Leave an opening for the arms where sleeves will be attached. Hope you love your granny sweater! That is a sumptuous cardigan, Jessica! Beautiful design, and can you imagine all of endless hippy-dippy color combinations? Ahh!! Haha – totally! It could be sooo hippy dippy!! I’ll make mine in a single color! 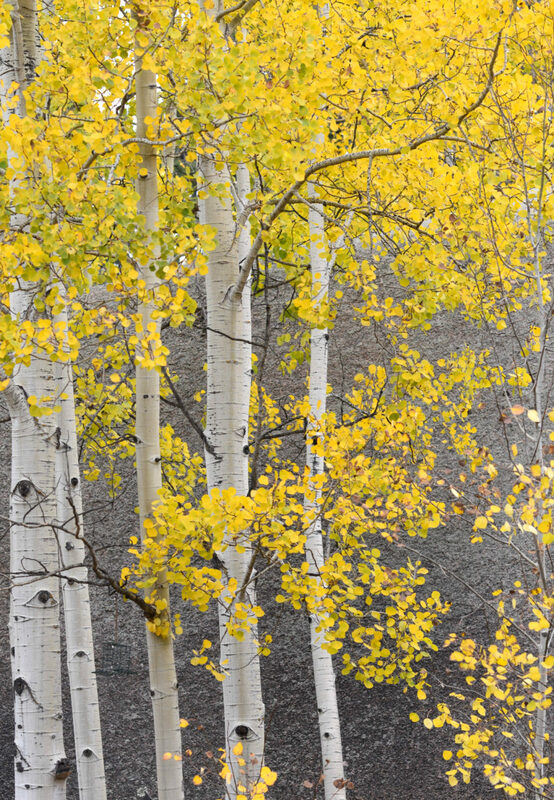 Imagine this in natural white merino wool. Getting started tomorrow. Granny goes elegant! This is so pretty, is there a knit version at all?!! No knit version – so sorry! You’re can do mitered squares in knitting pattern. Yes, you sure can! Thanks for pointing that out! I love it, but I don’t know how to crochet. I need to ,earn how. Jessica, this is amazing! Your talent knows no bounds! 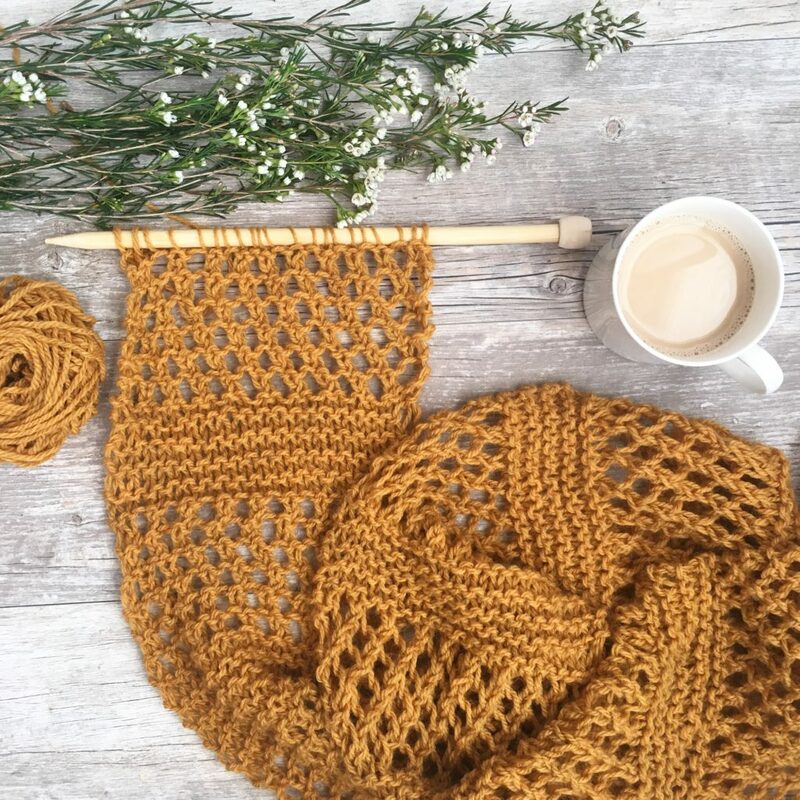 When I saw that you used Lions Brand Wool Ease I breathed a huge sigh of relief, because as much I like granny squares they can be scratchy and/or stiff if made with certain yarns. The Wool Ease is luscious and soft. Not only is it stunning but,Arlo is my fur-baby name so this is definitely a must make for me ! I love it. You can do in so many colors. Want mine in purple. Ty for so many great patterns. One of the best granny square cardigans that I have seen. Definitely on my to do list for next winter! Hi Jean! It includes all of the details and photos of assembly. Thanks for asking! I love this so much! It really does look like it’s straight out of Anthropologie! Thanks for another great pattern. Ahhh thanks Christina! And you’re welcome of course – it’s so fun to share these projects. LINDO! LINDO! LINDO! From Brazil. 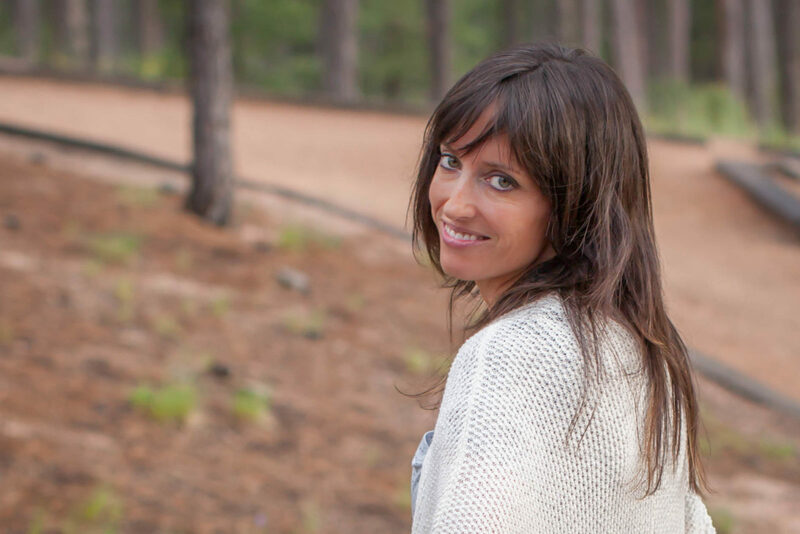 Have recently found all the treasure on Pinterest – particularly your easy, beautiful patterns and Jess’s stuff at makeanddocrew. I have RA too. I feel like I found my “tribe” lol. The fact that my favorite patterns come from fellow Jess’s and that it’s my name too is just too much coincidence! Hi Jess! How fun to hear from another fellow Jess!! That’s so cool and I’m a fan of Jess at Make & Do too! Thanks so much for writing to me and for your sweet words! I love this cardigan!! I am really looking forward to getting started. I was reading through the pattern and I have a question about the sleeves. It says that one sleeve is made up of 8 granny squares but when I look at the photos, it looks like one sleeve is made up of only 4 granny squares. Is there an error in the pattern? I am a little confused. Yes, you’re right! It’s made of 4 – my brain was counting the two at the top that kind of slump over the shoulder but that is totally wrong! I corrected the pattern – thank you! Okay, I’m new to making cardigans and this one seems easy besides the fact I am a little larger then a medium. I am usually a size xl so I read the description on how to make the cardigan bigger but I am a bit confused. Would this work in a cotton yarn or would it not hold its shape? I think it would work in cotton! But I haven’t tried so I can’t say for certain! Hi! I am ready to start this fantastic duster but need to confirm one thing. The suggested size of hook for the Wool-Ease yarn is J/6mm but your pattern calls for a L/8mm. Can you confirm that you are using a larger hook than suggested for the yarn? Also, do you have a Facebook or Instagram where others have shared their creations from your fab pattern? I would love to see other colors! Many thanks for sharing this! Hi! Just started making the granny squares for this pattern! I’m using lion brand pound of love and noticed the squares ended up at around 6 inches rather than 7.5. Would you recommend adding an extra round or would it work better with the pattern to use a larger hook? Thanks!